A suspect was taken into custody, authorities said. Woods said the shooting appeared to be intentional, but it's unclear whether the suspect was targeting anyone in particular. 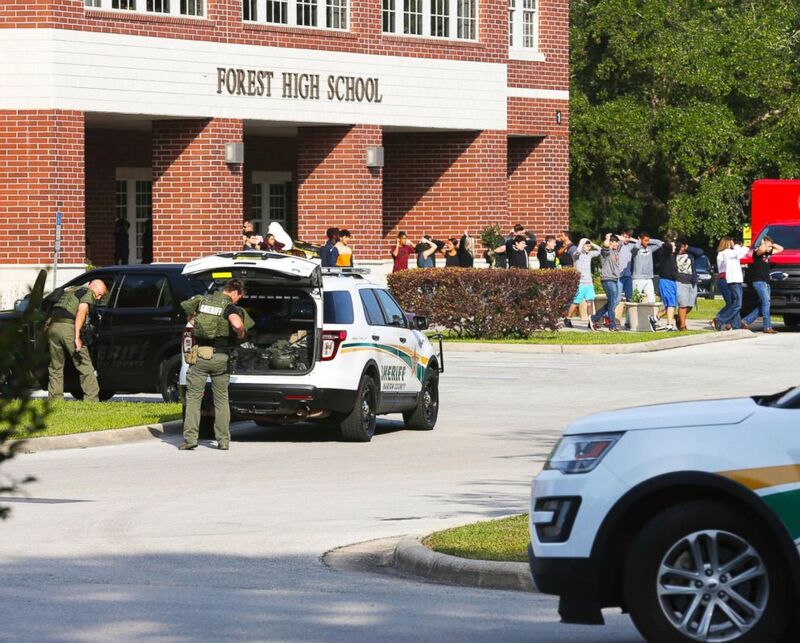 (Bruce Ackerman/Star-Banner via AP) Students are led out of Forest High School as law enforcement agents prepare to enter the school on April 20, 2018, in Ocala, Fla.
Bouche faces eight charges, including terrorism, aggravated assault with a firearm, culpable negligence, carrying a concealed firearm, possession of a firearm on school property, possession of short-barreled shotgun, interference in a school function and armed trespassing on school property. The arrest affidavit shows Bouche was allegedly using a 17.5-inch barreled shotgun and the report indicates police suspect he was under the influence of drugs, but not alcohol. Bouche is listed as a resident of Crystal River, Florida, which is about 40 miles southwest of Ocala. 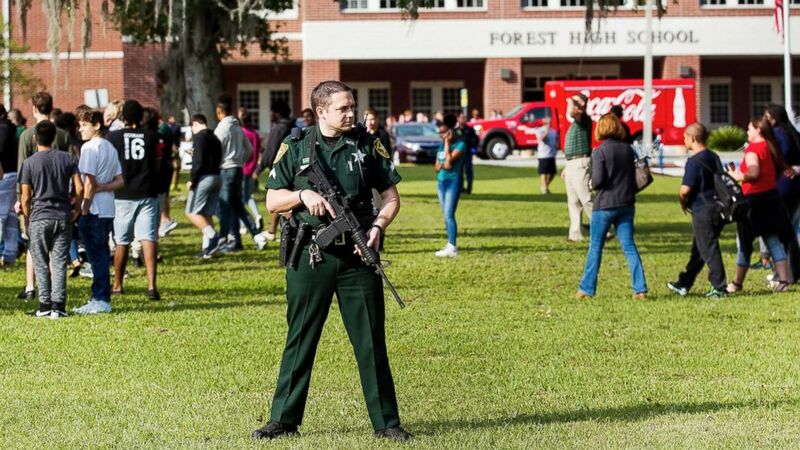 Bouche arrived on campus with the shotgun hidden in a guitar case and put on a tactical vest and gloves in a bathroom before the shooting, according to the Marion County Sheriff's Office. He also allegedly told police after his arrest that he had originally planned on carrying out some type of shooting on April 13 -- Friday the 13th -- but "chose to target a school because he thought it would gather more media attention." As Bouche was escorted out of the Marion County Sheriff's Office Operations Center, he was hounded by questions from reporters. When one reporter asked if Bouche was "trying to shoot someone," he shook his head. "I shot through the door," he said. "I didn't see anyone." 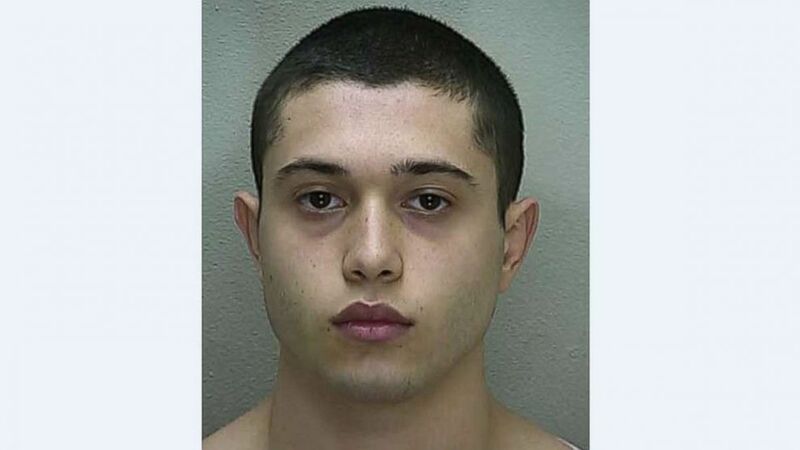 (Marion County Sheriff’s Office) Sky Bouche, 19, faces eight charges, including terrorism and aggravated assault with a firearm, after allegedly shooting a student at Forest High School in Ocala, Fla., on Friday, April 20, 2018. Then, when asked by a reporter what he would say to the victim's family, Bouche replied, "Sorry." "It doesn't make it better, anyway," he said before he was led into a police van. Woods called the injured victim and the deputy for took Bouche into custody "heroes." When Woods visited the injured student in the hospital, he said he told him, "I am so glad it was me and not one of my friends." The shooting took place in the school's main building, according to Marion County Public Schools. Approximately 2,200 students attend Forest High School. The students were evacuated and the high school placed on lockdown, along with 17 other schools in the area. 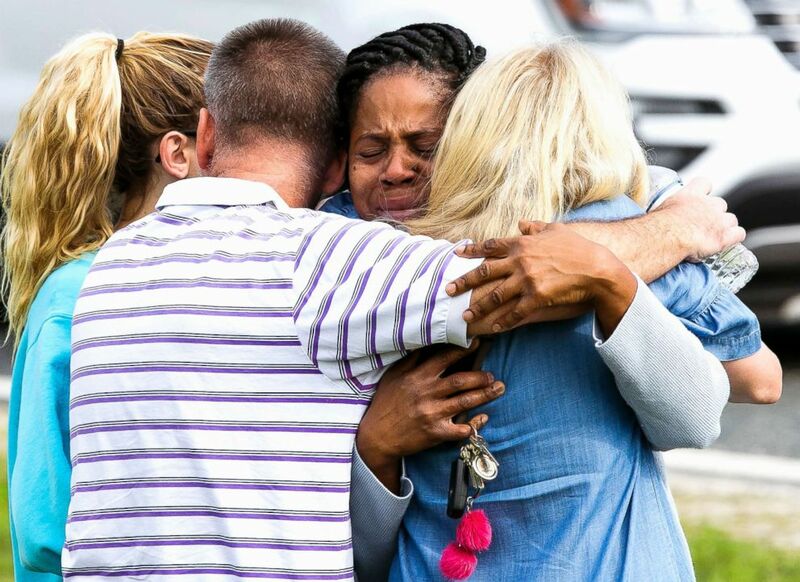 (Doug Engle /Star-Banner via AP) A Marion County Sheriff's Deputy stands outside Forest High School as students exit the school after a school shooting occurred on April 20, 2018 in Ocala, Fla.
(Doug Engle /Star-Banner via AP) Nikki Brown, center, hugs others in front of Forest High School on April 20, 2018 in Ocala, Fla. However, one of the student organizers of Friday's walkout said the event is a direct response to the mass shooting in February at Marjory Stoneman Douglas High School in Parkland, Florida, which left 17 students and educators dead. "The fact that this keeps on happening ... I knew I needed to do something," Lane Murdock, a sophomore at Ridgefield High School in Connecticut who helped organize the walkout, told ABC News.